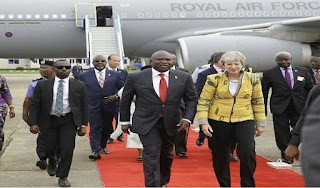 British Prime Minister, Theresa May, has revealed that the Lagos State Government can explore the export credit finance to the tune of £750 million (pounds) which the UK government has in place for considerable development finance. May disclosed this at a meeting with the Lagos State Governor, Mr Akinwunmi Ambode in Lagos on Wednesday. The British PM who said she was happy to be in Nigeria and Lagos in particular to see the thriving business community also spoke on the important role that a stable government in Lagos plays in giving extra confidence to investors in the state. May also outlined roles that the British Government could play in the development of the technology industry in Lagos given the particular capability of the UK in that area. In that regard, she disclosed that she brought as part of her delegation, an expert in Fintech to explore the opportunity in this area that Lagos could benefit from. The British Prime Minister also noted the special strength of the London City as a financial hub that could be of considerable importance for Lagos State, just as she emphasized sustainability and growth in Britain-Lagos relationship. Also, she expressed the desire of the British government to assist Lagos in the development of her creative industry and alluded to the fact that the jacket she was wearing when she met with the Governor was actually made in Nigeria. In his remark, Governor Ambode said Lagos remained a place of choice for British investors especially given that stability in the government, the size of Lagos economy and population as well as the particular focus of his administration on the rule of law and justice sector reform.